The Block Model is a cubic & rectangle graphite block with alternate rows of holes passing perpendicular to one another through the block as a stack structure. The graphite block is held between two clamp plates and two graphite block process headers complete with backing plates, pressure pads, studs and gaskets under a pre-set compressive load. 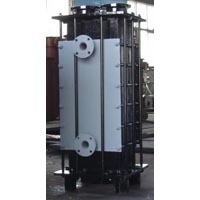 Cubic Block Graphite Heat Exchangers have extensive use as condensers and liquid to liquid heat transfer equipments. Cubic Block Graphite Heat Exchangers advantage results from the rapid assembly and disassembly in plants. In addition, this version is very service friendly and is particularly easy to maintain.